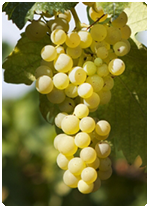 Trebbiano – Trebbiano is a grape in ‘white berry’ that has its origins in Romagna, going back to the Etruscan and Roman period. 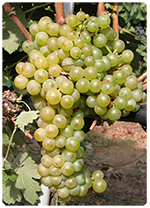 Over the years, the family of grape varieties sprang from the ancient strain of Trebbiano, including that of Apulia, closely related to that of Romagna. In this region from Trebbiano light, delicately fragrant, tasty and to be drunk young, cool temperatures and youthful ardor wines are produced. Malvasia – Native vine with white fruit mainly present in blends in numerous DOC Apulia, has a slight aroma reminiscent of Muscat, with simple and refined taste. The origin of the name is due to a wine that was produced in Malta, it was a quality product marketed by Venice. After the conquest by the Arabs in 870 AD the trades were interrupted. Merlot -Merlot is a red grape variety, native to the areas of southern France, whose name derives from the special love that the blackbird has got for its berries. 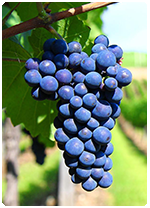 The vine has a medium, pentagonal, three-lobed and five lobes leaf; the cluster is medium, pyramidal, more or less loose; the grape is medium, round and blue-black.In most of the wine producing areas of the world, Merlot is inseparable companion of Cabernet Sauvignon. Sangiovese – Sangiovese is one of the most common varieties in Italy and although not originally from Apulia, is a variety widely grown in the region and appreciated around the world for the structure, fullness of taste, elegance and aging capacity. Sangiovese has recently met with great popularity in California, thanks to the international success of the so-called wine “super Tuscans”. Montepulciano – Its origin is not of Apulia but in Apulia it has found a optimal climate and a territory for its development. Montepulciano is very common in the area of Foggia and Bari, where the soils are medium-dough, deep and with good exposure, with warm and dry climate. 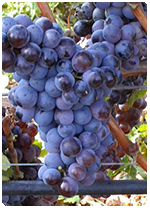 It has medium, pentagonal and five lobes leaf, the cluster is medium, conical or cylindrical-conical, with one or two wings, medium compact; the grape is medium, sub-oval in shape and black-purple. 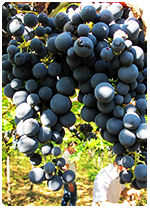 Nero di Troia – The origins of the grape are not certain, but it is certain the link with the city of Troy. Among the legend that wants Diomede landed on the shores of Gargano bringing the vines, which here it has found its natural habitat, to Frederick II of Swabia who loved to taste the “full-bodied wine of Troy”, until you get to the Marquis D’Avalos who purchased the city in 1533, and noted the absolute quality and attitude of the surrounding land, they significantly increased crops of this grape.